Bleeding Cool did nice interview with Marvel Studios' Pres Kevin Feige in which they asked him if there were any archetypal super hero concepts he would like to bring to the MCU. Feige's answer was pretty interesting, "The one we haven't done in the MCU is the secret identity thing. I thought that had been overplayed for a long time which is why we had Tony Stark out himself at the end of his first movie. We were sort of announcing to the audience that we're not going to play that game." For me it was a huge shock to have Stark announce his identity to the world so fast; it was a running theme for quite a few years that not even the other Avengers knew Iron Man was actually Stark. Feige goes on to answer Bleeding Cool's question on if there's a new spin to be put on the whole masked-man, secret identity concept, "I think there is and I think we will get to it at some point. We have an idea. As a matter of fact, I was just talking about it the other day with one of our filmmakers. The fun thing about the job, though, is that idea I was talking about with a filmmaker might not happen for four or five years because it may or may not be appropriate for a first movie." Feige adds that things he talked about several years ago are happening now, reaffirming that Marvel has had a big plan for a long time now and that they plan to keep going for a while longer. 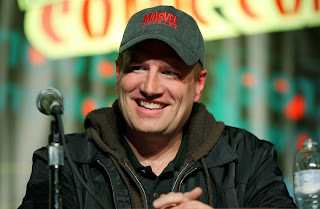 Bleeding Cool goes on to speculate that Feige might just be talking about Daredevil, a property Marvel recently recovered and one about which Feige has talked recently, saying they are trying to figure out what to do with it right now. Of all the characters that Marvel has yet to unleash, Daredevil is the one that comes to mind as fitting the secret identity bill the best, although there could be any number of other heroes that might be a fit as well. I did find it interesting that Feige mentioned it being inappropriate for a "first movie", hinting that the character may by introduced into the MCU before becoming the focus of his/her own film. Thoughts, comments, questions or connections on the Marvel secret identity film? Let's hear them! Who's your Daredevil?